Phase One is a Danish maker of digital camera backs. Phase One works closely together with sensor makers like Dalsa. The company made a large investment in Mamiya late in 2007, and Mamiya is described as 'a Phase One company' on its global website. Phase One also bought Leaf, which was previously one of its main competitors, in 2009. The P+ series are similar to the normal P series but have higher capture speeds, better response to long exposure times, and add LiveView which allows the user to focus and compose on a monitor while tethered. The P-series are fully untethered backs available for many different camera mounts. P21: 18 MP, introduced May 2006. P30: 31.6 MP, introduced in November 2005. P45: 39 MP, introduced in December 2005. 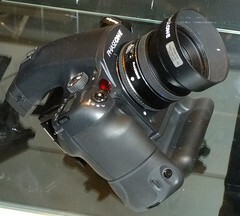 The H-series are tethered backs available for many different camera mounts, and a computer is needed to operate them. The PowerPhase series are tethered digital scan backs. PhotoPhase: 5,000 pixels x 7,200 steps (36 MP equivalent). PowerPhase: 7,000 pixels x 7,000 steps (49 MP equivalent). PowerPhase FX+: 10,500 pixels x 12,600 steps (132 MP equivalent). The sensors of these backs offer enourmous dynamic range. Software for one-shot camera backs and 35mm DSLR cameras. This page was last edited on 12 July 2015, at 17:02.